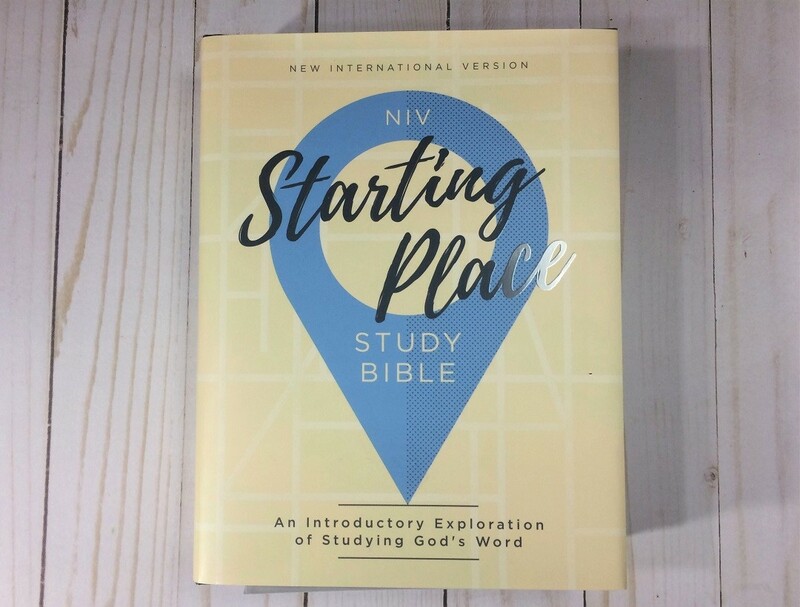 The NIV Starting Place Study Bible is designed to help people with “an introductory exploration of studying God’s Word.” Zondervan has brought together material from various sources hoping to help people understand God’s love and build a relationship with the Savior. The version I have is the navy hardback that comes with a yellow paper dust cover. It measures approximately 8 3/4″ x 6 3/4″ x 2″ and weighs just over 3 pounds and 2 ounces. It has a sewn binding and one navy ribbon marker attached. The paper is white and thicker than I expected for a study Bible. I found the pages fairly easy to turn. The bold navy and yellow color scheme does mean there is some show through here and there, but it’s not usually distracting. 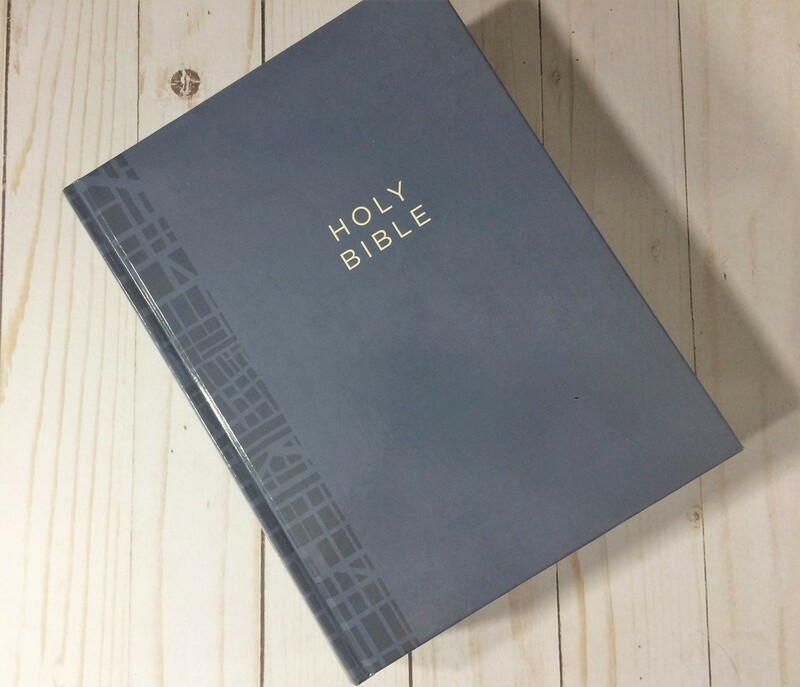 This Bible is also available in navy/tan or two-tone blue Leathersoft (with or without thumb indexing) and ebook format. The text is set in a two-column paragraph format. 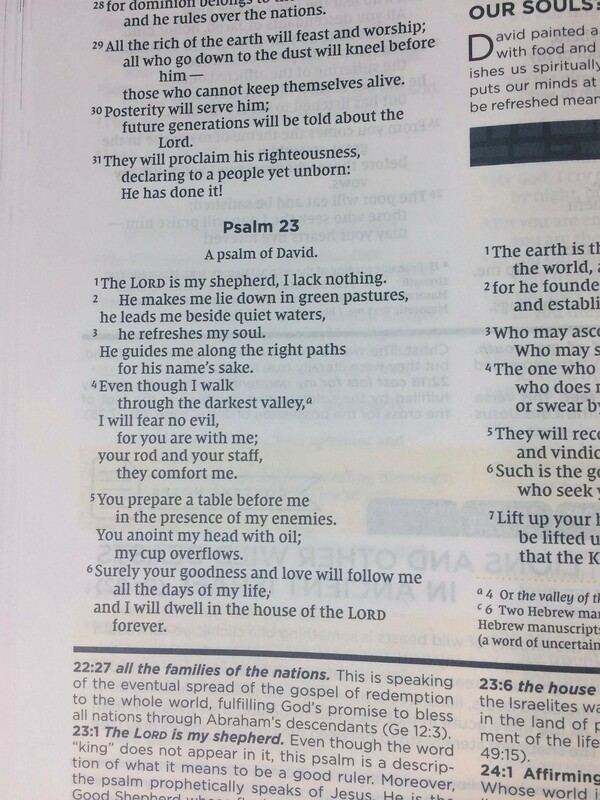 The header has the page number and the guide verse on the outer corner. Poetry is set in stanzas and letters and quotes are offset. The text is all navy (not black) and is a 9.7-point font when compared with Times New Roman. 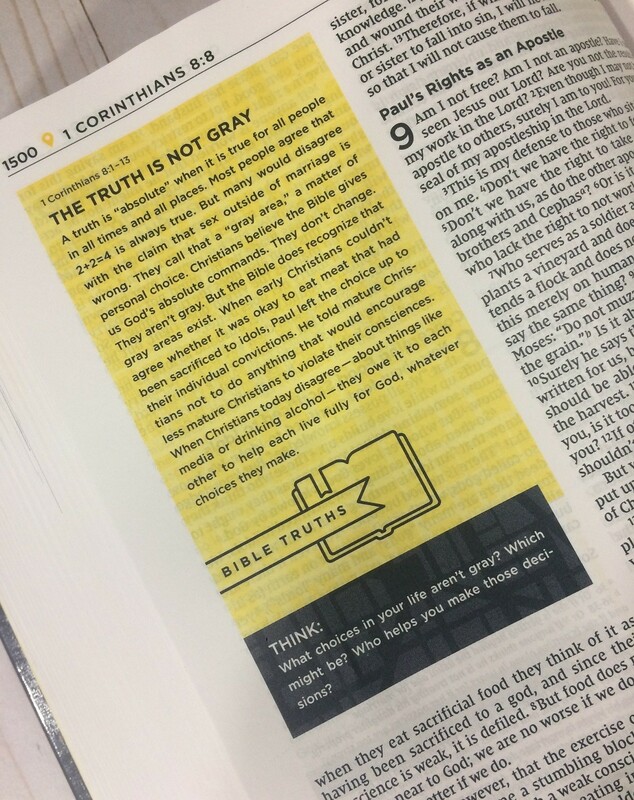 Only varying shades of navy and yellow ink are used for the various note types and highlights and both colors stay at consistent darkness levels throughout the Bible. 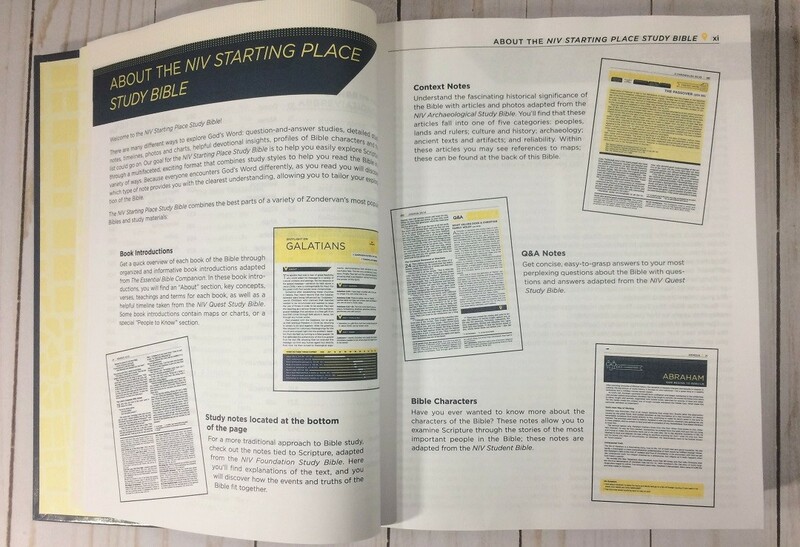 The Starting Place Study Bible is set in the NIV Comfort Print font. This font was carefully designed by 2K/Denmark to be readable at any size. The translation notes and key references that are usually found in an NIV translation are included. Located above the bold navy line, they are at the bottom of the second column and separated from the text by a small yellow dotted line. These notes have superscript italic letters as indicators within the text to help you line them up to the correct passage. 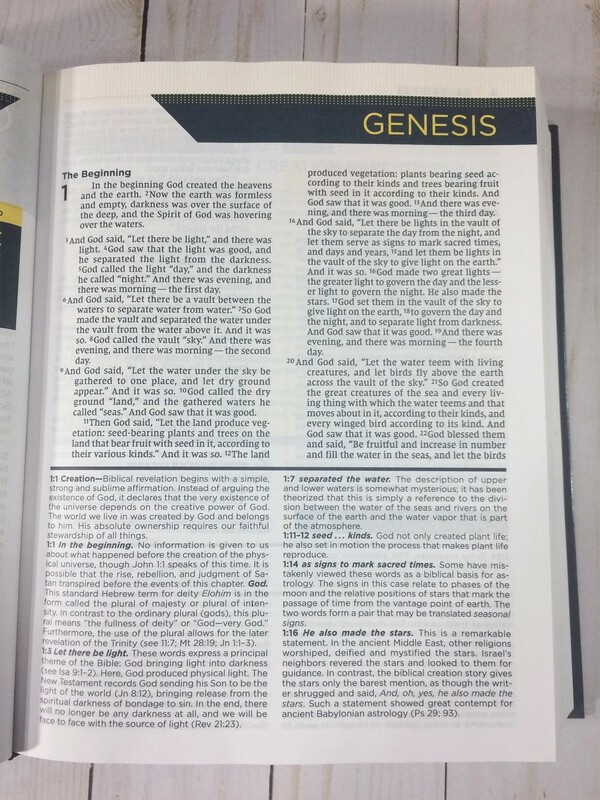 Primarily adapted from The Essential Bible Companion these introductions contain a brief summary in the “about” section. There are lists of key concepts, verses, teachings, and terms. Maps, charts, or lists of “people to know” are also frequently included. 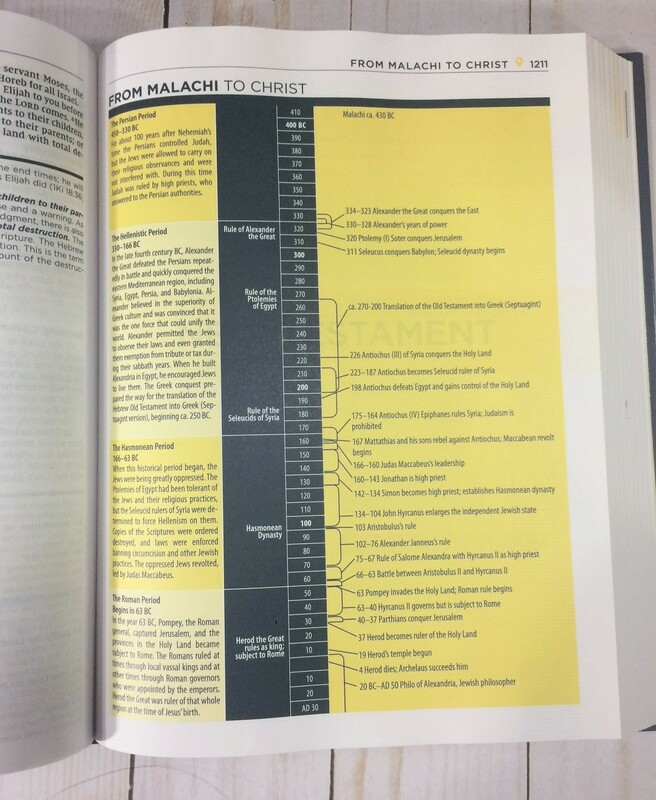 Timelines taken from the NIV Quest Study Bible have also been included. A few of these introductions or spotlights cover more than one book sometimes grouping together similarly themed numbered books (like 1 and 2 Kings ) or prophets (like Haggai and Zechariah). There is a total of 56 spotlights for 66 books. 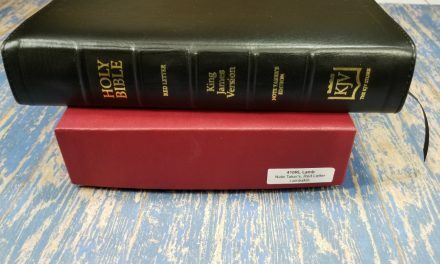 2 and 3 John are the only books grouped together in the New Testament. Book introductions are usually one of my favorite types of study notes and these are well-done. They do a good job of giving you the setting each book was written in and the core message each book is meant to convey. The style and color of the design elements that set each type of study note apart stay consistent throughout this Bible with one exception. While every spotlight has the navy bar with yellow pointer dividing the sections of the introduction, the header of the spotlight and the banner on the first page of each book change from navy with yellow lettering in the Old Testament to yellow with navy lettering in the New Testament. 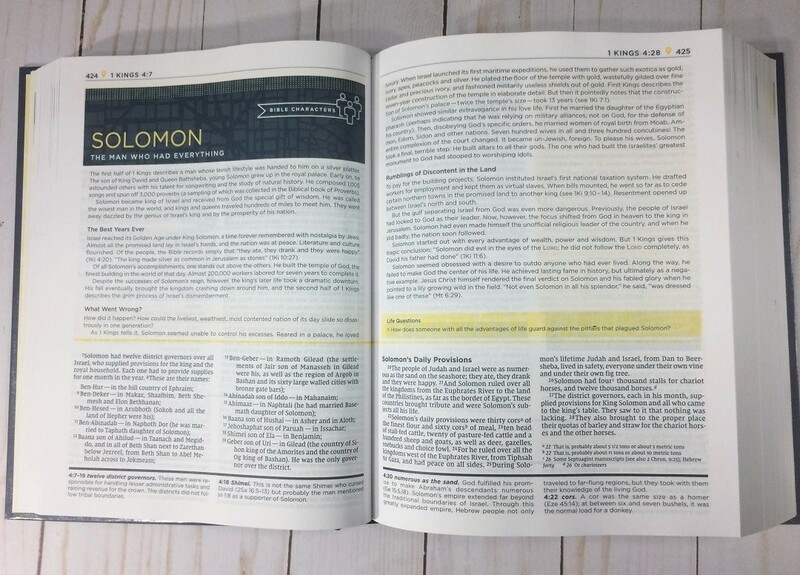 Over 6,000 Study notes from the NIV Foundation Study Bible are included and are found beneath a bold navy line on the pages of biblical text. These have the verse number and the word or phrase the note is about in a bold. The font has been changed to further distinguish them from the text. Many of these notes are interesting or helpful but these are my least favorite of the notes. In the attempt to make the notes as clear as possible opinion and doctrinal slants do tend to creep into this kind of notes. 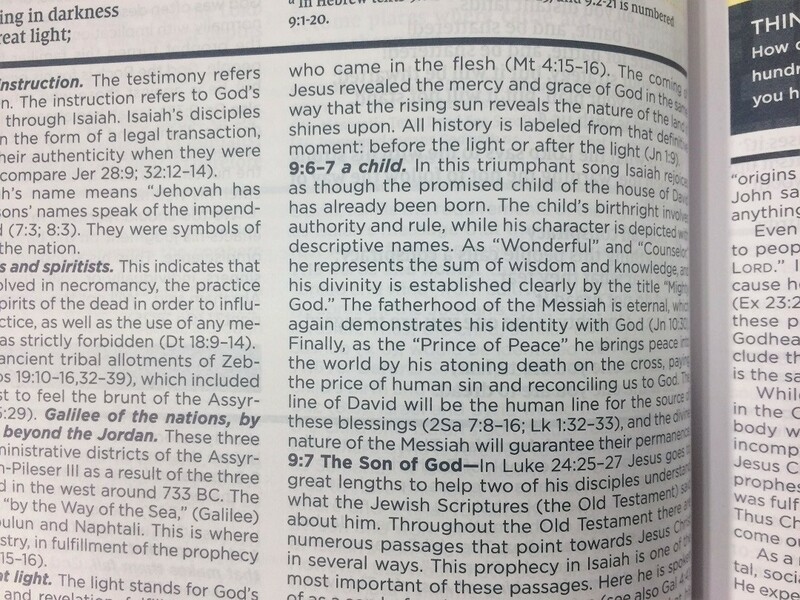 The notes in the NIV Starting Place Study Bible are no exception. 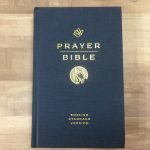 They can still be helpful but I caution readers to consider them prayerfully and to remember these are nowhere near as infallible as the biblical text itself is. 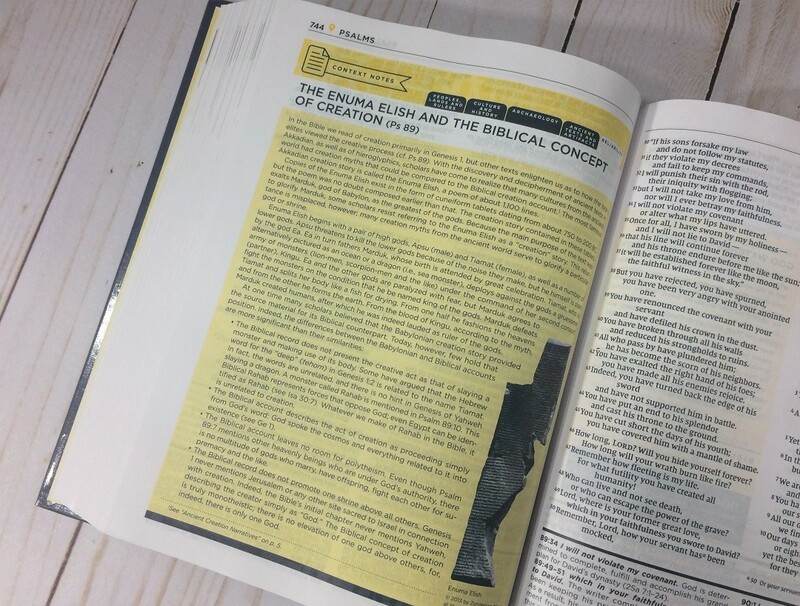 Context notes help you understand the historical significance of the Bible. 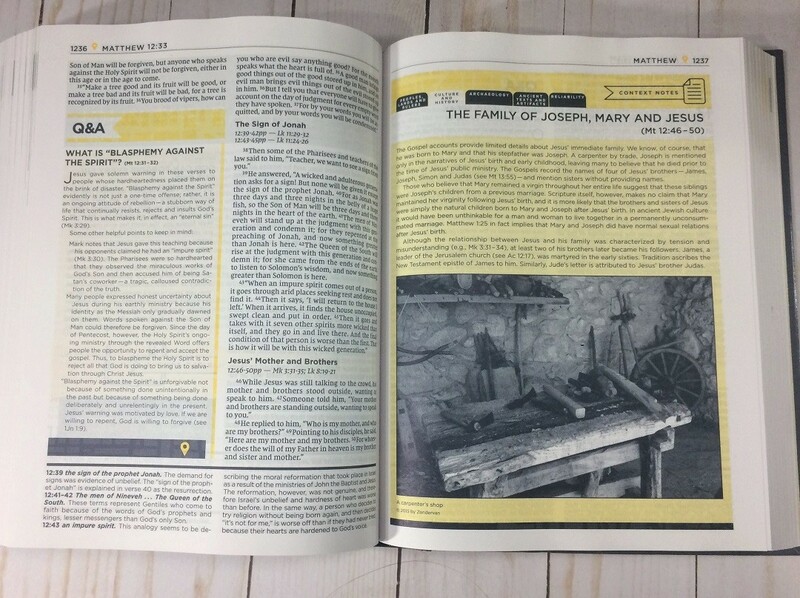 Set apart by a bright yellow bar with tabs at the top and a light yellow background these articles and photos are adapted from the NIV Archaeological Study Bible. The 146 context notes cover five categories: peoples, lands, and rulers; culture and history; archaeology; ancient texts and artifacts; and reliability. 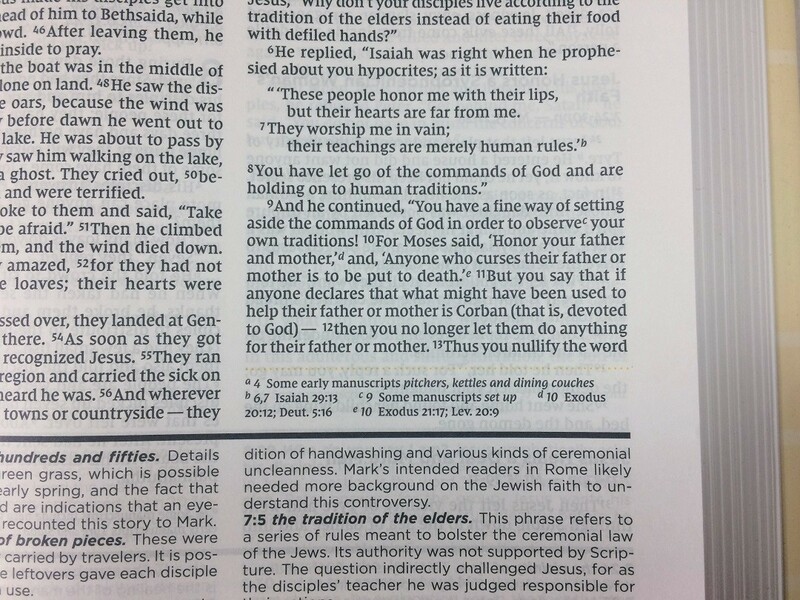 Notes and article that help me understand the history and culture of biblical times are always among my favorites. 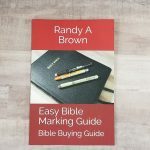 And all of us here at Bible Buying Guide like to study about the manuscripts the Bible is based on and anything that proves the reliability of the Bible. 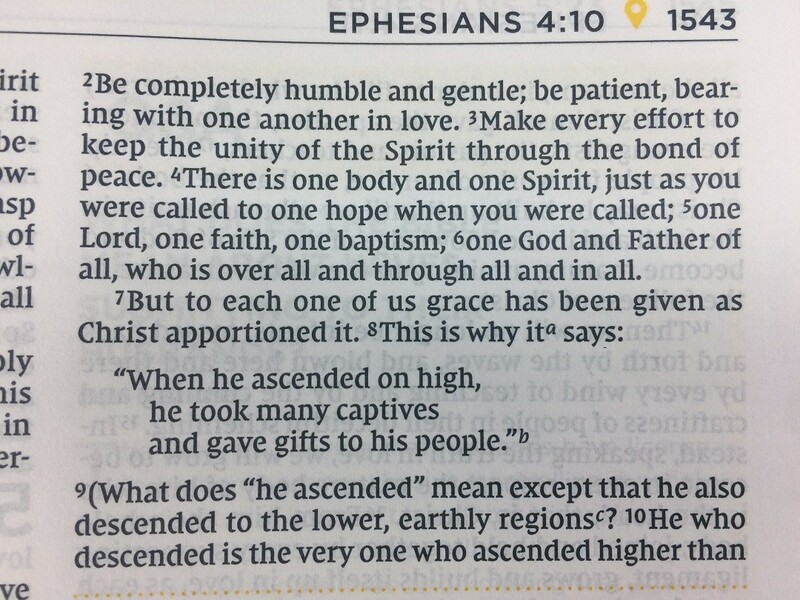 I highly recommend that anyone who purchases this Bible spends some time in the context notes. 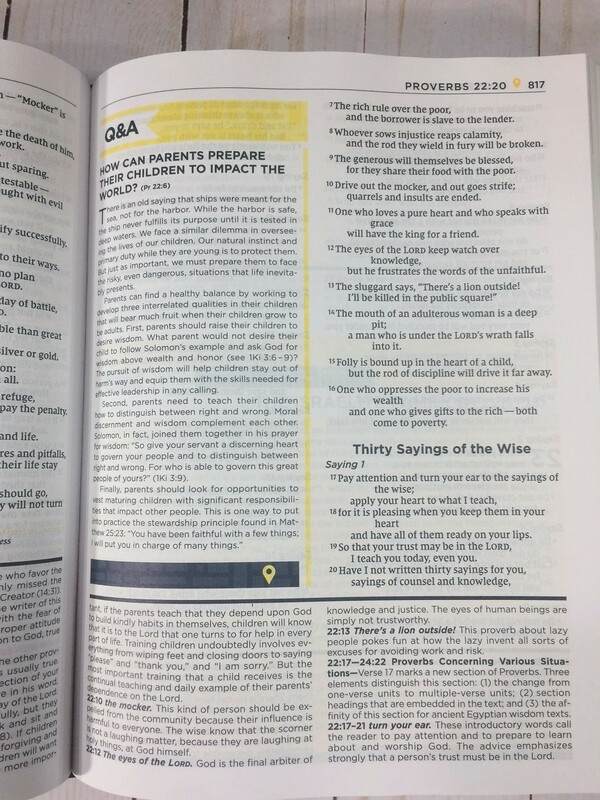 Dealing mostly with either questions that new Christians have or the questions that all Christians get asked by those outside the faith these 282 notes are adapted from the NIV Quest Bible. These short answers are set apart by a thick yellow band at the top, a thin yellow line down the right side, and a navy stripe with a yellow pointer at the bottom edge. Keyed mainly to the verse that most frequently brings up the question these answers usually refer to other passages of scripture. Some of these are concise and complete answers that will be all you need. Some are a little less comprehensive and a few have a slight doctrinal slant. Of course, some of these questions would be difficult to answer fully with several pages of text. I found that even the less complete of these notes give you a good starting point for further thought and study. 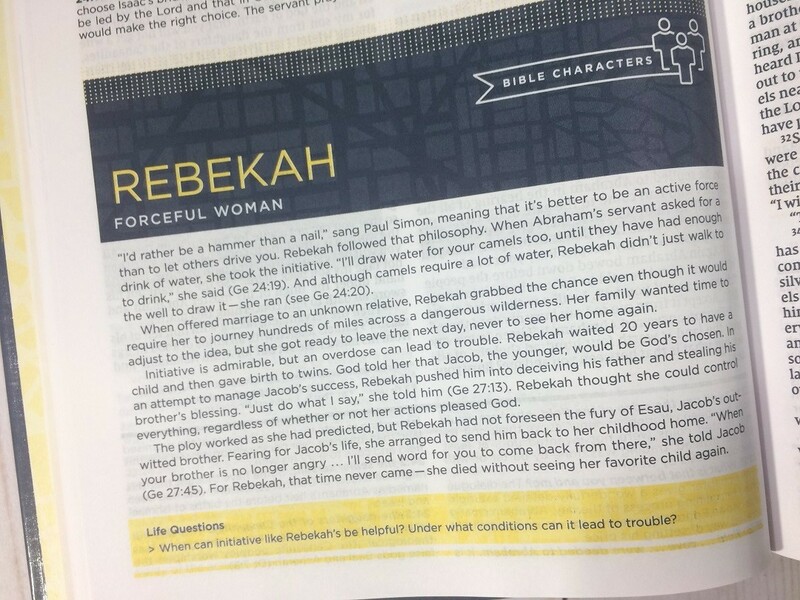 88 Character profiles adapted from the NIV Student bible have been included. They have a patterned navy header and span the full width of the page they are on. They include a subtitle that lets you know what aspect of the person they are focusing on. 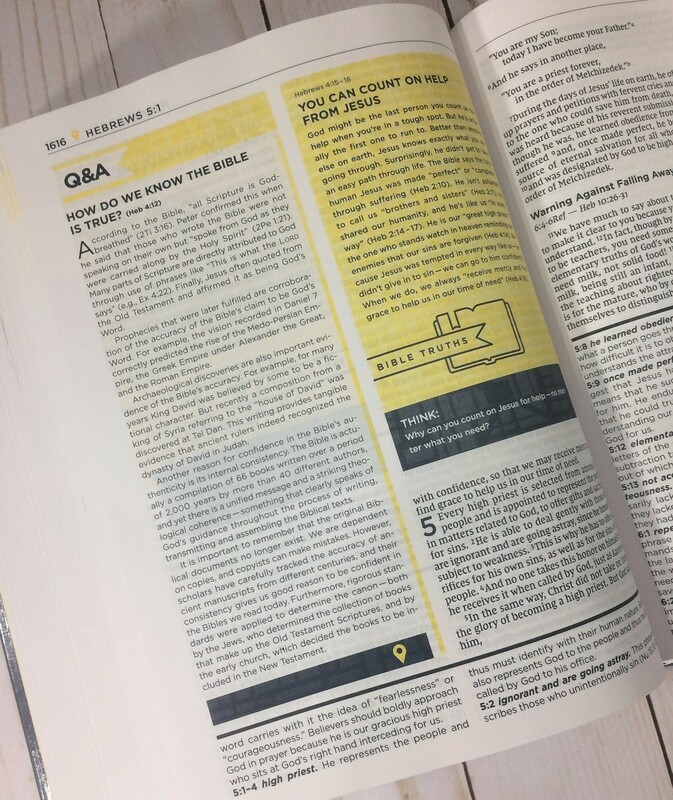 There are questions at the end, highlighted in yellow, to help you apply the lessons each person’s life teaches to your own. These profiles are pointed out in the “People to Know” sections of the book introductions and a full index of them can be found in the front of the Bible. 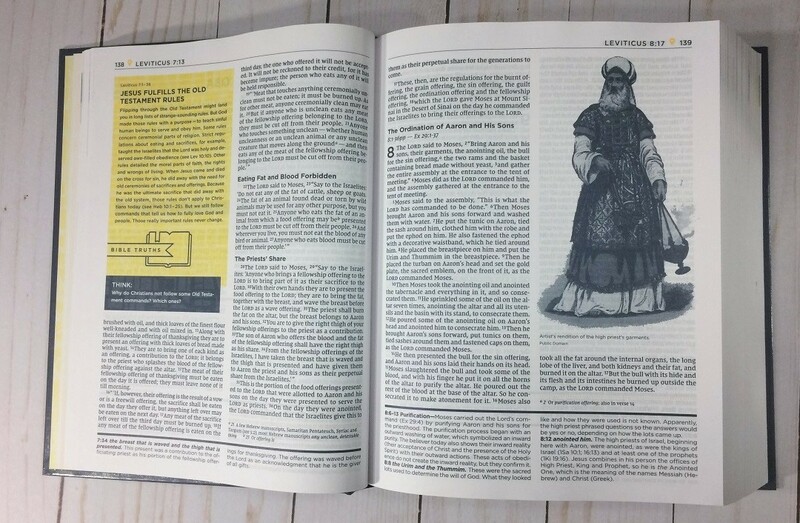 Character studies are a feature of many study Bibles. These compare well with other character profiles I’ve seen and the questions at the end are my favorite part. 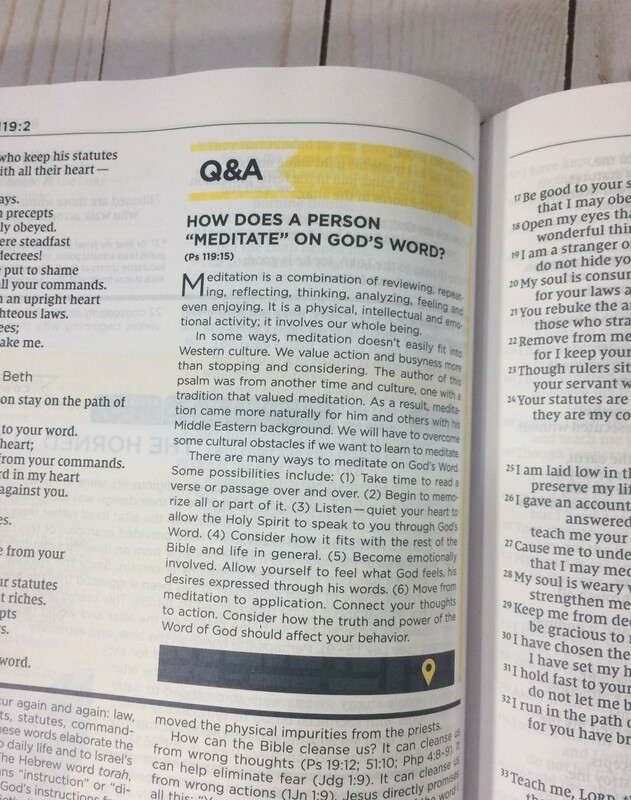 The Bible Truth notes also end with questions to help you think further about the subject. 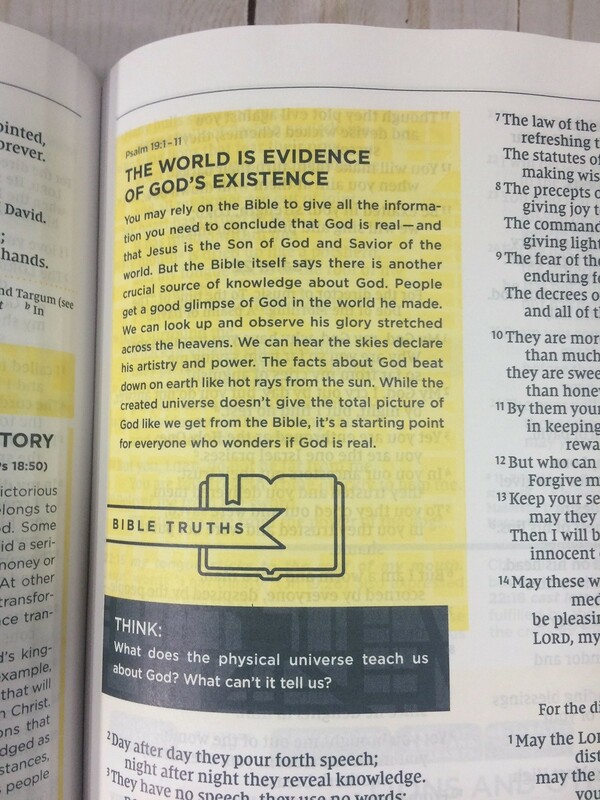 These 138 notes deal with core Christian beliefs and their basis in Scripture. Adapted from the NIV Rock Solid Faith Bible, they are intended to ground you in the truth of God’s Word. A few of these “truths” are not universally believed by Christian churches and I personally wish a few of them went a bit farther in their explanation. There is a lot of information contained in these though, and a better understanding of many of these “truths” would greatly benefit most people. 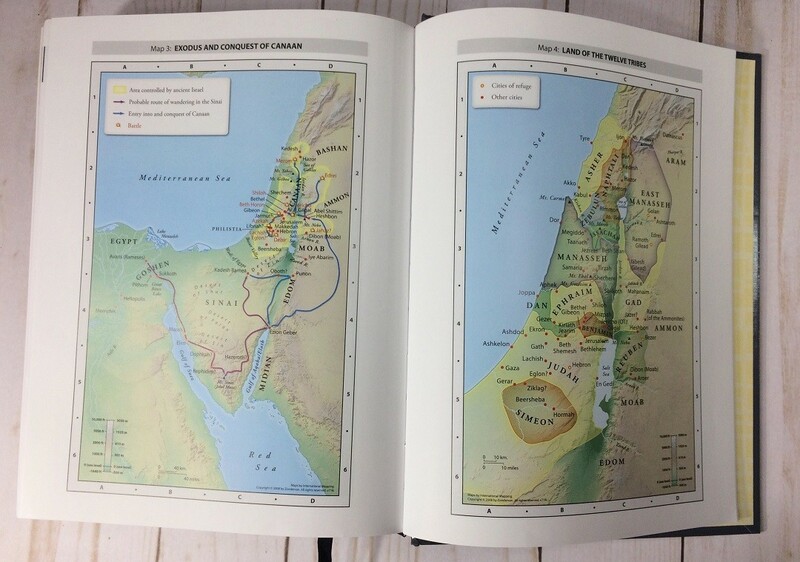 This Bible also contains quite a few in-text charts and maps. I have found these additional charts and maps to be well designed for ease of use and very well placed. The maps are right where you might have been wondering about distances and directions to various locations and the charts are in useful locations as well. 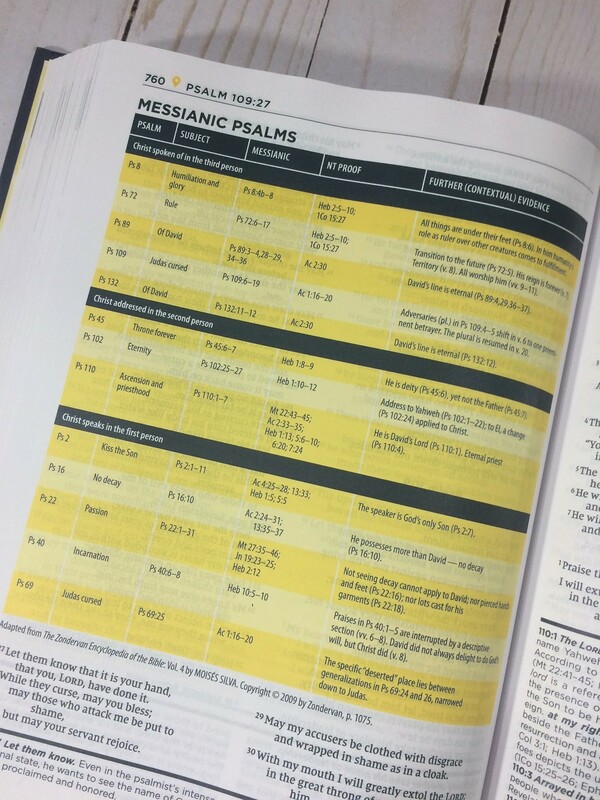 A few of them, like this Messianic Psalms chart, list which Zondervan publication they are drawn from. I’m guessing the rest were either adapted from one of the 6 main Bibles and reference materials this Bible draws from or were specifically created for this Bible. 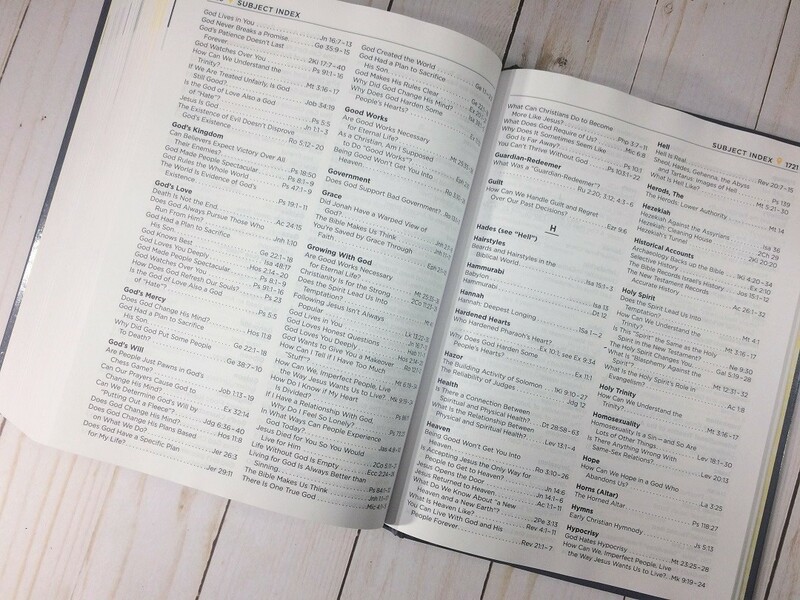 If you have been wondering (like I was) how you are going to find a specific note you want to reread or share with others you’ll be relieved to know the back of this Bible includes a Subject Index. It doesn’t include the verse-by-verse notes, charts, or maps but all of the other notes seem to be here. It even includes the character studies that have their own separate index. Keying it to the Scripture the note is about instead of the page it is located on will make it take a bit longer to find a few of these, but it does help remind you to read the scriptural passage along with the note. Several Reading Plans with boxes to check off are also printed in the back. 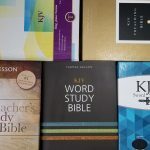 The One Year through the Bible plan goes straight through the Bible, from Genesis to Revelation, a few chapters a day without any rereading or skipping around. 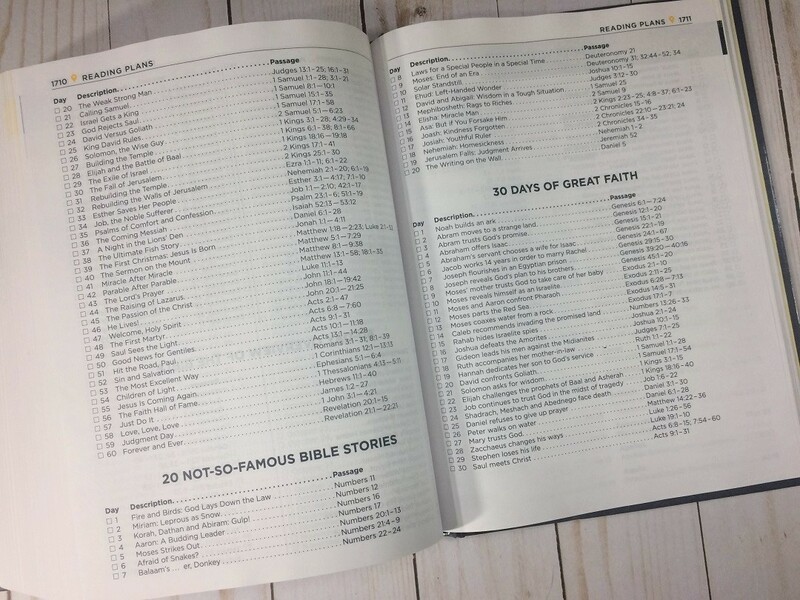 If you would rather start smaller they have included 4 other shorter reading plans: 60-day Overview of the Bible, 20 Not-So-Famous Bible Stories, 30 Days of Great Faith, and 30 days with Jesus. 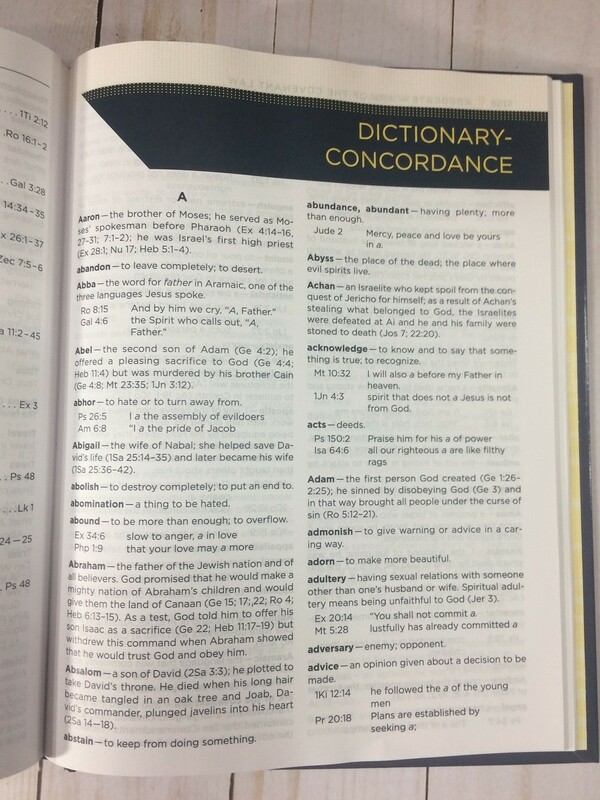 There is a combination dictionary/concordance with short definitions for all the words included and a small list of references for most of them. 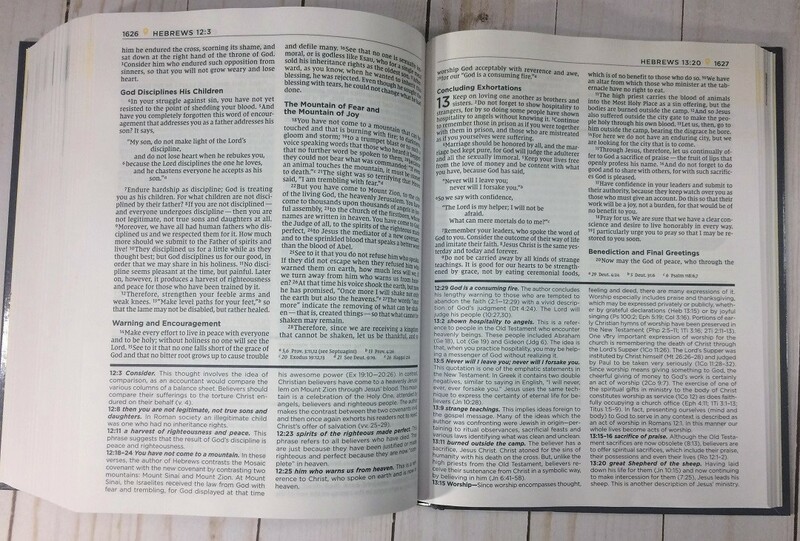 I usually prefer a larger concordance but a dictionary is an essential tool for those who aren’t familiar with Bible terms. 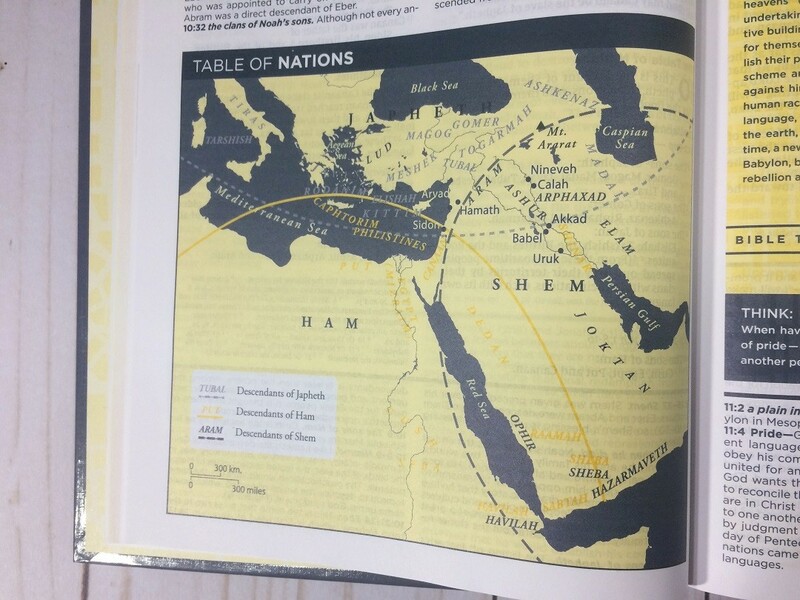 A handful of full-color maps is included in addition to all the two-color maps that are in the text. 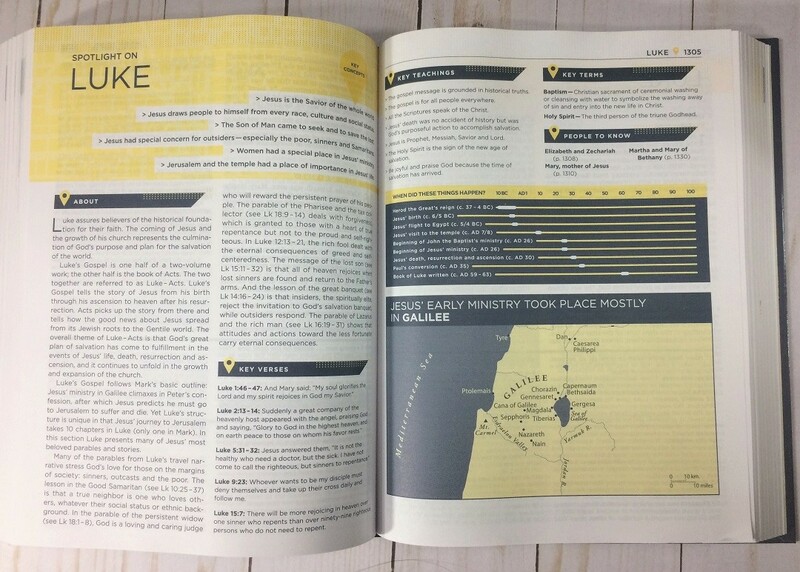 The Starting Place Study Bible is a really interesting Bible with a wealth of study material included. 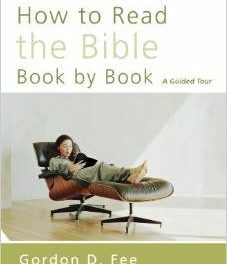 Designed for those new to studying instead of just reading the Bible (no matter how long they’ve been familiar with it) it has a nice focus on God’s love and the need to grow in a relationship with him. The variety of presentations, both in looks and writing style, means that everyone should find something they can connect with. I do wonder if the sheer volume of extra material might be a bit overwhelming for some people at times. 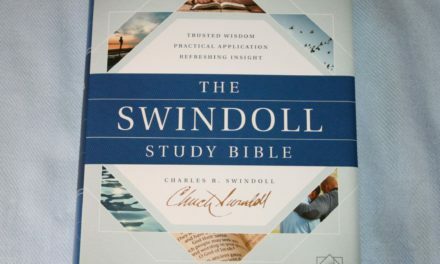 I would recommend studying this Bible either taking the time to read the biblical texts more than once while studying all this Bible has to offer or get a nice text-only edition of the Bible also to read whenever you need to ground yourself back in God’s Word.